well established clubs in Vilnius and is more than 7 years old. It is conveniently located in one of the narrow Old Town streets and is mostly known for always being packed and as one of the most casual clubs in Vilnius. 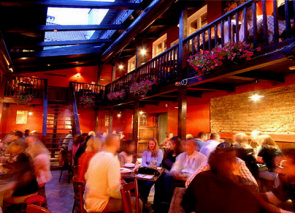 The interior here is a mixture of something that looks a bit like a spacious countryside barn and an Irish pub. There is lots of space to dance. 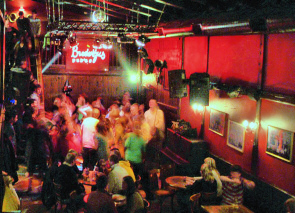 Brodvejus is one of the clubs to get that taste of a local party in Lithuania, as its full of local people and they often have famous local bands playing live Lithuanian music. Locals actually have a divided opinion about this venue -they either love it or are quite sarcastic towards the place’s popularity of being too unpretentious and having music that is a mish mash of different styles and decades. The people here are as eclectic as the music; the club is popular with different age groups. Most clubbers, though, on the night that we visited were local students. Overall the venue is cheerful and loud and the majority doesn’t really care about wearing more than jeans. The spacious main area is spread over two floors. Lija and I managed to get one of the last tables left on the gallery overlooking the dance floor. The playlist was featuring songs of different decades with pop dominating on the night.As we arrived well after midnight, the music was already pumping and people looked like they were really having fun on the dance floor. Brodvejus is popular during national festivals, the interior is thematically decorated and they also feature special programs. In the warm season they open up the roof which adds to the atmosphere. 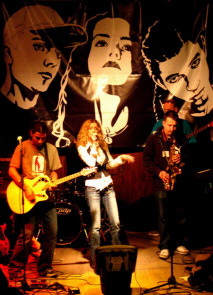 Famous foreign bands like Fools Garden hold their concerts in the club. (Photo left, A famous Lithuanian singer, Erica Jennings, originally from Ireland is on the stage. The waitress service was friendly and rather quick taking into account the amount of people waiting at the tables to be served. The menu offers a variety of snacks, salads, appetisers, main courses and deserts all of them being very inexpensive. The beer is cheap as well. but if you are looking for something with a touch of exclusivity and glamour you will be better off in other Vilnius clubs that we have listed. The club also attracts some stag parties, just to let you know if that’s not your thing. Entrance fee: 2 - 6 €.